Subordinating conjunctions are words that introduce adverb clauses. You can also think of them as the glue that holds a dependent adverb clause to an independent clause. I read because I love stories. In this sentence, because is gluing the dependent clause because I love stories to the independent clause I read. There are many subordinating conjunctions. Clauses are groups of words that contain a subject and a verb. Clauses can be independent or dependent. Independent clauses can stand alone as complete thoughts, and dependent clauses can't. Dependent clauses must be connected to independent clauses in order to make sense. There are three types of dependent clauses: adverb clauses, adjective clauses, and noun clauses. Adverb clauses are dependent clauses that act as adverbs. That means the whole clause modifies a verb, adjective, or an adverb from another clause. He whistled while he walked. He whistled is an independent clause, and while he walked is a dependent adverb clause. The dependent adverb clause is modifying the verb whistled from the independent clause, and it is being introduced by the subordinating conjunction while. 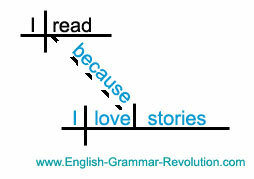 To diagram sentences with adverb clauses, start by identifying and diagramming the independent clause. Then, find the dependent adverb clause. Diagram the adverb clause below the independent clause, and connect the two clauses with a slanted, dotted line. Put the subordinating conjunction on the dotted line. Directions: Diagram the following sentences. All of these sentences contain dependent adverb clauses and subordinating conjunctions. The adverb clauses in these exercises modify the verbs in the independent clauses. Because of this, the slanted, dotted line should come off of the verb in the independent clause. 1. If the weather is nice, I will be happy. 2. Whenever my dog barks, my cat meows. 3. I ran until my legs hurt. 4. I won the race because I practiced. 5. As I walked, the sky became dark. 5. 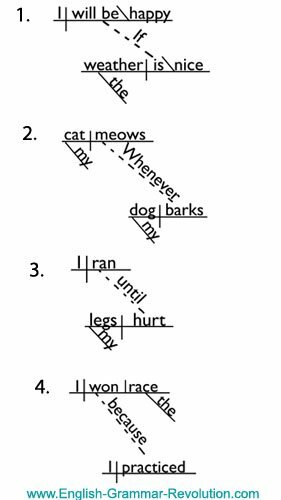 This answer is only available in the Sentence Diagramming Exercises Ebook. 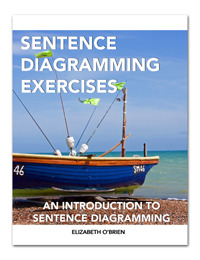 You'll learn grammar and diagramming with these short, simple lessons and exercises, and you'll find all of the answers in the back so that you can easily check your work. When you're done with this book, you'll possess a powerful tool for using and understanding language. You'll be able to write with clarity, and you'll actually enjoy grammar. These exercises are a terrific resource - especially for my students who struggle with their basic skills. This is my first year teaching English and you have been very helpful! Move on to Chapter 9.